Scope and Content Erskine Ferry, Erskine, Renfrewshire There was probably a ferry crossing here from an early date, and there was certainly a regular ferry in the early 19th century. It was known for many years as the East Ferry, and belonged to Lord Blantyre, owner of the Erskine estate until 1907, when it was purchased by the Clyde Navigation Trust. This shows the southern terminal of the ferry, which was operated by a double-chain vessel. The ramped jetty seen here was built by the Clyde Navigation Trust, but the ferry-house was built by the Erskine estate in the mid 19th century. Note the chains on which the ferryboat pulled itself along. 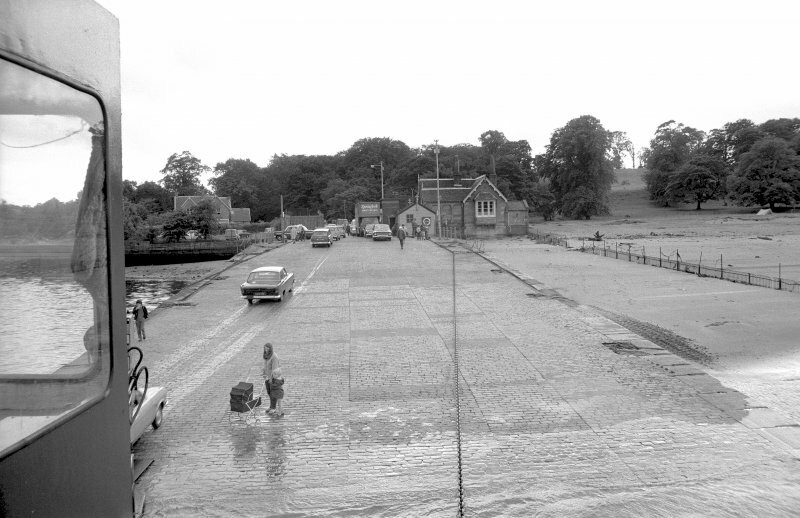 The Erskine Ferry ceased to operate in 1971 when the Erskine Bridge opened. The ramped jetties survive both here and at the northern terminal at Old Kilpatrick, and are used as launching ramps for small craft. The last ferry-boat was used as a standby boat for the Renfrew chain ferry until that closed in 1984. Source: RCAHMS contribution to SCRAN.